Peloponnese is a unique scenery of picturesque landscapes, featuring glorious history and interesting present. A tour in one of the most beautiful places in Greece, Peloponnese Tour is the perfect choice for an authentic experience of seven days or more. 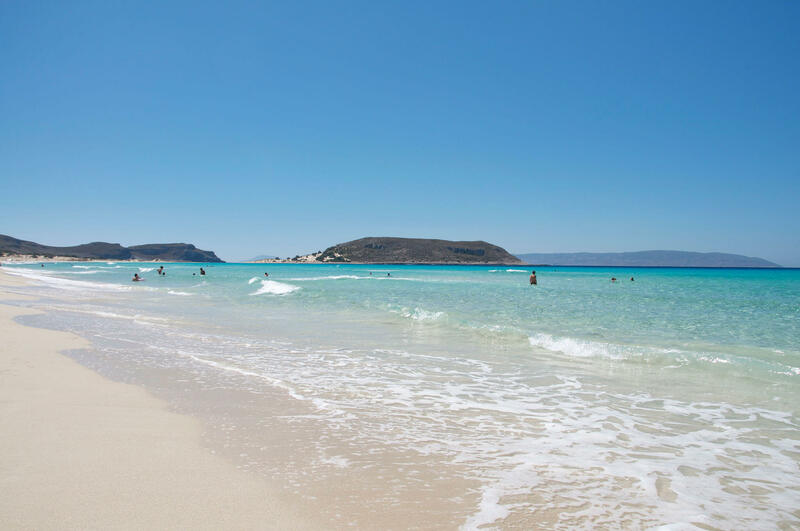 In PeloponneseTour.com we present the best hotel choices, top attractions, traditional restaurants and beaches with crystal-clear waters. Peloponnese Tour is one of the most authentic travel experiences in Greece. Travelling in the villages is a unique way of understanding the everyday life in Greek country. No matter whether you will travel to Peloponnese by car, motorcycle all an alternative transportation option such as local buses or a boat, making a plan of your tour will be really useful and will save you from effort, money and time. Organize Peloponnese Tour in advance, define the areas that you would like to visit, find the most interesting spots of each place, schedule your transportation, arrange your accommodation and experience authentic Greece to the maximum! We have created handcrafted tour selections for you, to help you get the most of your trip to Peloponnese. Combine the tours, choose the suggestions that you prefer and create your own mythical Peloponnese Tour! Picturesque villages by the sea, with the traditional architecture of the area. Wild mountain sceneries with small yet magnificent settlements. Grandiose hotels featuring luxurious accommodation options and services. Small traditional restaurants, serving the delicious local cuisine. 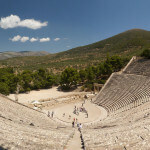 Explore Peloponnese Tour and enjoy one of the most interesting travel experiences of your life. Peloponnese Tour is a trip that needs to be well organised. How many days should one spend in every destination? Which are the best hotels? Which are the nicest restaurants? Where should one swim? In PeloponeseTour we have collected the most useful information in order to make sure that your experience will be unique. Lennon Eco – Gastrobar is a a brand new all day cafe restaurant in the centre of Patras just 10 minutes walk from the port. Hotel Papanikola is situated in a leafy environment, you will have the opportunity to enjoy breathtaking scenery and experience unique moments of relaxation. The La Gratella is an Italian restaurant in Nafplion, who stole the impressions from the first moment of its operation. This is an authentic Italian trattoria housed in a building of 1626, on Filellinon Square. Our philosophy is the total comfort and hospitality. The complex has 7 rooms and 6 suites. In more detail Finday Suites eco Boutique Hotel consists of 6 suites (type: Deluxe) of 40 m2 each, able to offer hospitality to its guests in two independent rooms. Finikounda is now one of the major tourist resorts of Messenia, combining harmonically mountain and sea. The attention of the visitors mainly attract the stunning sandy beaches with crystal clear waters. The monastery attracts thousands of pilgrims and during the whole year. From the balcony of the church the visitor will see all the beauty of the land of Elis by forest Folois and magnificence of Erymanthou. Welcome to Trikala of Corinthia, the oldest settlement in the region, built on the slopes of Ziria. Here stands the restaurant Opos Palia, which means like the old times. Travel to Greece and choose Peloponnese Tour for an authentic and full of excitement trip. Reach the area by plane through Athens and Kalamata and visit Corinth, Patras, Pyrgos, Olympia, Sparta, Mani, Nafplio and other smaller yet interesting travel destinations. 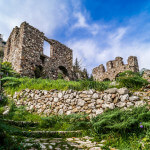 Peloponnese Tour is a unique experience for every traveler. Rent a car during your arrival in Greece, make your detailed plans and get ready for a magnificent road trip through one of the most beautiful areas of Greece. In our Peloponnese travel guide you will find all the necessary information that you need to arrange your trip. Hotels and vacation rentals, restaurants and tavernas, bars and various entertainment options… all the information that you need is gathered in one website: www.peloponnesetour.com. Ancient times exposed in thematic units and through them shows the history of the Olympic games, the longest institution of antiquity. Apart from ancient art, the visitor has the opportunity Detailed information through rich visual material. Domaine Mercouri is in the West. Peloponnese on the plateau of Cape Pisces, in the area Tower Karakohori municipality, very close to the port of Katakolo and approximately 30 Km from Ancient Olympia. The Archaeological Museum of Mycenae was built in a way that ensures direct contact with ancient remains, parts of which are visible through the large windows and the visitor comes across the path from the entrance of the site, where the ticket. The Gofas wines produced on the estate is a combined result of the excellent raw material we receive, the modern equipment of the winery and the sound scientific training of oenologists Venus Kyriakou and Panagiotis Thamnidi. The Open Air Water Power Museum in Dimitsana, highlights the importance of water power in traditional society. Focusing on basic pre-industrial techniques that utilize water for the production of various products, linking them with the history and daily life of the local community through the years. Antonopoulos Vineyards is a creation of Konstantinos Antonopoulos, a man who believed in the extraordinary quality of the Peloponnese soil and particularly the mountainous and semi-mountainous Achaia, giving an efford to make superior quality wine production areas. The Stymphalia Environment Museum, which seeks to demonstrate the interdependence of man and nature, focusing on the harmonious coexistence in Stimfalia basin. The monastery of Malevi or the Dormition of the Virgin, is one of the three most important monasteries in the Kynouria province, together with Loukou and Elona. 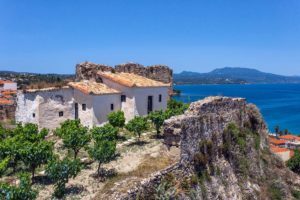 Following the track “Leonidio Kosmas’ through diverse vegetation and the towering wild rocks in a bend of the road will look to raise the rock hovering Panagia Elona monastery with whitewashed hung at the foot of. Then the temple was dedicated to the Virgin Faneromeni dedication associated with the miraculous image of Our Lady of Cyzicus (Artaki), the cult of which enjoyed widespread Paleologos era. The Archaeological Museum of Patras is one of the most prominent museums in Greece, along with the National Archaeological Museum of Athens and the Acropolis Museum, as well as those in Thessaloniki, Delos, Delphi, and Olympia. The variety and quality of Peloponnese Hotels is impressive. New hotels or renovated traditional buildings are designed to accommodate visitors who travel to Peloponnese and provide an authentic travel experience. From cozy boutique hotels in small and picturesque villages of Peloponnese to impressive resort hotels in the seaside, there are numerous accommodation properties that you can choose during your Peloponnese travel experience. 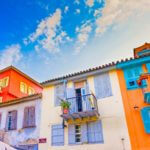 Explore Peloponnese Tour and choose among our handpicked suggestions, your own best hotel in Peloponnese. If you travel experience includes a road trip then you may choose your beloved hotel in every area that you will visit. Combine hotels by the sea and hotels at the mountains and enjoy the multiple images and landscapes of Peloponnese. Whether for a romantic getaway or family vacation, Nefeles Luxury Residences and Lounge is the perfect destination. With residences decorated in country style and earthy tones, configured to accommodate all requirements. Just two and a half hours from Athens, Porto Heli is a unique holiday resort which ideally combines relaxation with a cosmopolitan atmosphere, Nymfes. 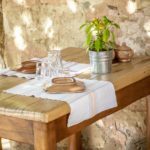 Helydorea is a warm, stone built guesthouse, with views of the Corinthian Gulf and the Roumeli mountains, waiting to host your short, or longer mountain getaways. Following the Country Club tradition, Trikolonio couples elements of the local architecture with classical and modern references. The decoration is complemented with authentic lithographs and engravings by artists such as Tsarouhis, Fasianos, Mitaras, Moralis, Galtemis and Pantelias. Elafos Spa Hotel is built of stone and wood, faithfully respecting the Arcadian architecture, offers its guests unique moments of relaxation and quality. The restaurants of Peloponnese offer a wide variety of choices. Traditional Greek tavernas with authentic local recipes, gourmet restaurants offering international cuisine creations, small meze restaurants and ouzo restaurants by the sea are ideal choices to explore local flavours or widen your taste experiences. Explore Peloponnese restaurants in the pages of Peloponnese Tour. Gourmet restaurants usually need to be reserved in advance, while meze places and tavernas usually don’t accept reservations and you have to visit them earlier than others in order to find a table. Popeye Bistro restaurant in Nafplio at the historic Staikopoulou street, offers italian cuisine. It is a renovated space in the old city of Nafplio, with minimal decoration and industrial style, a full open kitchen and friendly atmosphere. The menu features the best italian specialities and culinary choices of Mediterranean gastronomy prepared daily by the famous and talented chef and owner Elias Kokkoris. At Popeye Bistro you will taste authentic homemade pizza with italian dough, pasta with porcini mushrooms, bacon, white cream and hazelnut, risotto with wild mushrooms and truffle aroma, escalope steak with mushrooms and cream, katsiatore chicken fillet with mushrooms, peppers and tomato sauceand many more special delicacies made daily with the finest local materials. Food at Popeye Bistro turns into a real pleasure. Among the romantic streets of Nafplio, you will find a very good restaurant for cheap eats in the center of the old city. Tavern with nice terrace on the sea. Fresh fish and seafood as Sheepshead, bream, barmouni, squid and octopus. The hour meats there are also the fresh salads. Try the soup of scorpion that iodine and fragrant lemon. Pasta with seafood always fresh upon request. Overlooking the old port in this pretty village, Lela’s has a terraced dining area shaded by a vine-covered pergola, with planters tumbling bright red geraniums. You can dine while watching the sun set over the sea and the moon rise behind the mountains. Be prepared to spend your evenings here for the setting as well as the food, which is simple, traditional and delicious. There are no menus, the day’s specials are on the board. You’ll get addicted to the aubergine dip, and maybe to the sweet prawns in fresh tomato sauce with feta, too. Arapakos restaurant in Nafplio offers greek cuisine, fresh fish and seafood by the sea. It is a family business that maintains tradition through exceptional recipes prepared daily with the freshest ingredients. The place is comfortable with beautiful furniture and elegance that matches the restaurant’s haute gastronomy. Arapakos’ menu is a tasty feast of seafood and hearty main course recipes. Here, you will taste delicious mussels in wine sauce, the best fried cheese, grilled shrimps, grilled fresh fish from the bay of Argolis, special pasta with lobster or spaghetti with shrimps, crispy stuffed dumplings with cheese and ham and amazing homemade pecan pie with ice cream. The cellar will match all your dining options. For the best fish in Nafplio, the famous Arapakos fish restaurant guarantees top quality of food and excellent hospitality. Pinakoti is located in Corinth, in Trikala, at an altitude of 1,100 meters, it has a balcony with panoramic views of famous ancient mountains, and the sea of Corinth. The Hippocampus restaurant is a new proposal in gastonomiko map of the wider Hermionid. Located in the center of Porto Heli 30 meters from the sea overlooking the homonymous bay. The kitchen Gargantua from morning and can satisfy the most demanding palates. The chef Nikos Mavraganis has chosen some of the best Greek products and has created a menu based on the Mediterranean diet. In the heart of Areopolis, one of the old stone buildings that surround the historical square of March 17 is the “pitching”. Since 2001 Greek and foreign friends enjoy our close tastes homemade, prepared with care and love, pure products of our country. A kitchen that keeps Mani culinary tradition alive without losing its freshness contact with today. Come from morning coffee and breakfast under the shade of the old mulberry or later for dinner and dessert. Try lamb in the oven with fennel, artichokes and potatoes and chickpeas with syglino for a tasty trip to Mani culinary tradition and choose among the finest flavors of Kayak ice cream, we have the pleasure to host in our fridges and homemade sweets and cakes we make almost every day, to enjoy fresh and pure. You will find us in the old town of Areopolis. Follow the paved road to the church of the Archangel, which in the evenings is pedestrian, and enjoy the Mani cuisine and hospitality. We will be glad to see you! The Admirals Flavors restaurant in Patra offers Greek cuisine and is ideal for dining in the city center. In one of the most beautiful corners of Patras you can enjoy the best fresh meats. It has been known for several years to gourmets and passersby for handmade and traditionally made food. The spits with fine meats come early in the coals, that they simmer and served delicious on your plate. The appetizers and salads ideally accompany the specialties of the restaurant. The space moves in shades of red and gray creating a pleasant atmosphere of a modern tavern. The Admirals Flavours restaurant is the perfect stop for lunch with your company at the center of Patra.